When launching our software Mosketch in May, we wanted to make 3D character animation intuitive, simple and fast. Today, we are releasing the latest update of our software, Mosketch 0.16, and we hope you will be as enthusiastic as us about the new features, the Ghosts and Mokto, the new branded character. When creating movement, it is now possible to display your character’s ghosts at different times in the animation. You can feature the current frame and superimposed previous and successive poses easily with a color code to better control the final animation result. This technique will help you gauge the distance and changes in your poses and allow you to rectify or perfect the movement from one frame to the other. You can display this ghost-view by selecting a range of 4 colours and simply place the sliders on your animation bar to see the before and after of your current frame. You take full control of your animation, gain in accuracy and simplicity. 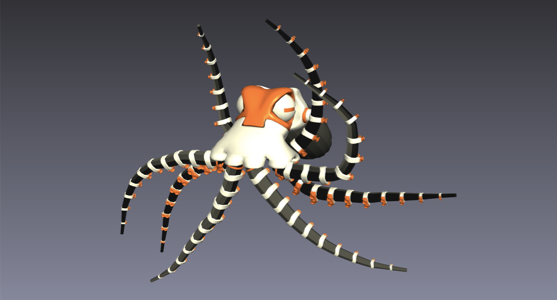 When downloading Mosketch 0.16, you will also get a free new character, Mokto, a 3D octopus. Mokto is not an easy character to animate, but with Mosketch, the complexity is reduced and it becomes fun to test and move around the sea creature with the stroke of a pen. We wanted to share Mokto with you and offer you more opportunities to try the software and create content. At this stage of our development, we are still in early access and we are working on features to allow you to import characters you have already created and been working with. Given Mosketch does not require rigs to animate, 3D characters with existing controllers are not compatible with our software yet. For now, enjoy working with Mokto, import controllers-free characters to animate them and we promise to provide future solutions to allow you to work with your favorite characters in Mosketch. We have also improved features such as the frame tool in 3D scene and Animation Curves and fixed a few bugs that you had reported about. We are a small but eager start up. Your feedback is key and will allow us to grow, perfect Mosketch and develop a tool that you will want to work with daily. Please reach out if you have questions or comments. We would love to hear from you! Moka Studio develops innovative and cutting-edge software for 3D character animation.